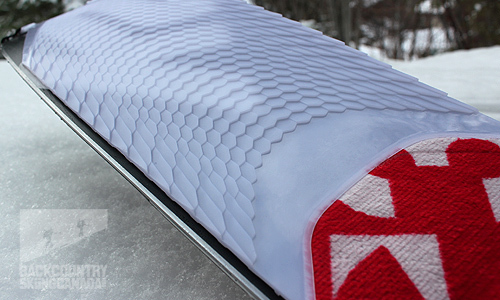 For the 2018/19 ski season, G3 is releasing a new line up of skins and has come up with a very simple way to help non-gear geeks determine which climbing skin is best for them. There will be five versions of skins to chose from in this new Alpinist Plus line of climbing skins, the Universal, Grip, Glide, Speed and Pow Skins. 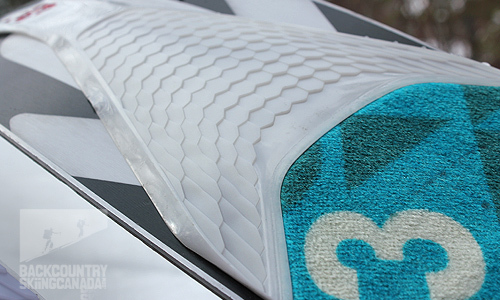 The Universal Skins will provide an optimal balance of grip, glide, and durability with a 100% nylon plush. They will be available in 100, 115, 130, 145mm widths and retail for $174-189US. 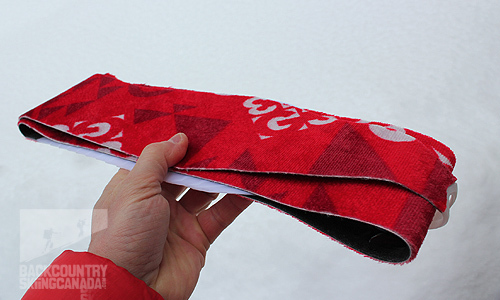 The G3 Alpinist Plus Grip Skins will maximum grip for steep ascents and icy skin tracks. The 100% nylon plush will be available in 100, 115, 130,145mm widths and will retail for $184-199US. The Alpinist Plus Glide Skins blend glide and grip for cold, dry conditions with a 70/30 mohair/nylon plush. They will retail for $184-199US and come in widths of 100, 115, 130, and 145mm. If you are looking for speed then the G3 Alpinist Plus Speed Skins are for you as they will maximum glide and speed by using a 100% mohair fabric. They’ll come in 100, 115, 130,145mm widths and will cost $189-204US. 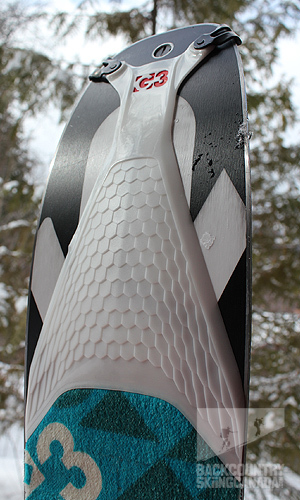 Finally, there is the Alpinist Plus Pow Skins that have an extended PU tip for extra trail breaking capability. 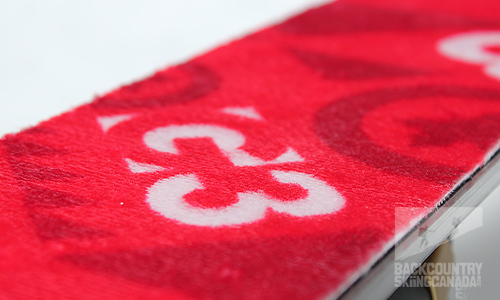 They’re only available in a 130mm width and will use a 100% nylon plush and cost $199US. 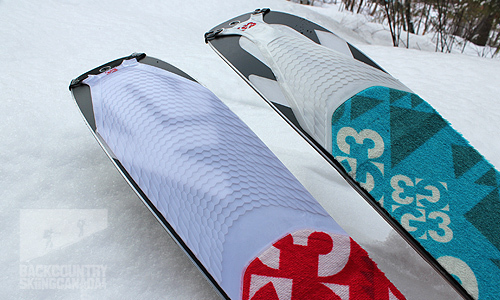 The Pow side-by-side with the Glide Alpinist Climbing Skins. 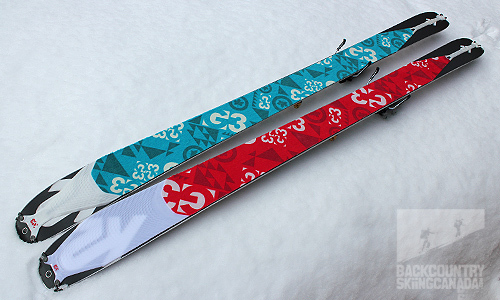 In this review, we’re going to look at the G3 Alpinist Plus Glide and Alpinist Plus Pow Skins, their features and how they compare to each other. 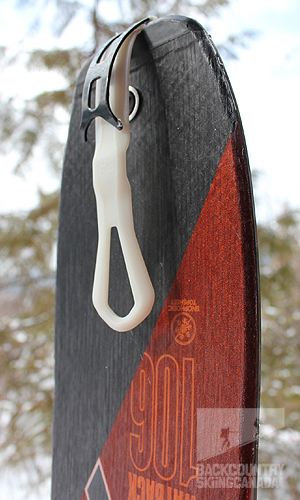 Both skins have a Poly Urethane tip to help reduce the migration of snow between the skin and ski base, however, the tip on the Pow Ski is much longer and not convex in shape like that on the Glide skin. 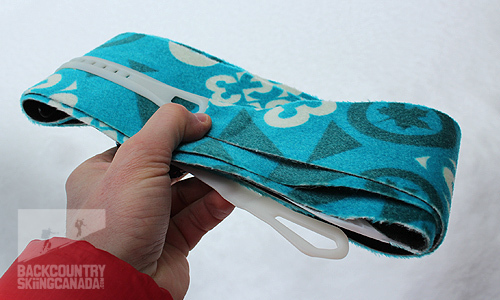 This additional length of the PU plastic tip helps reduce friction when breaking trail in deep snow. Because of these plastic tips, the Alpinist Plus Skins are folded end-over-end and not glue on glue like traditional skins. This allows you to easily store them in a pack or jacket pocket. 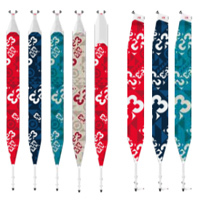 G3 has also improved upon their tail cam design to make it even easier to use and has also lengthened the adjustable tail strap so that less skin material is required, thus saving weight. The self aligning tip connectors remain the same because, well, if it ain’t broke, don’t fix it. 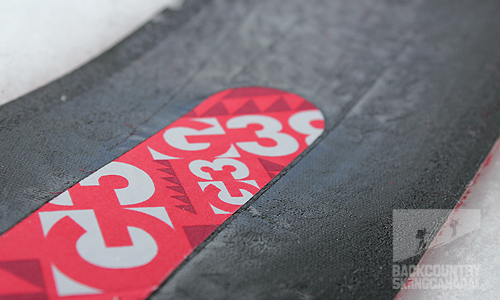 For the split boarders out there G3 will be releasing three new Alpinist Plus skins designed to work with split boards, the Universal, Grip and Glide.These will have all the same attributes of the regular skins mentioned above but obviously mad specifically for split boards. 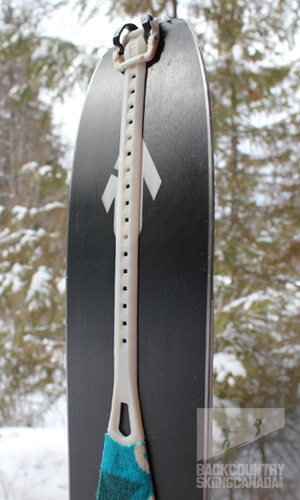 Plastic tip to reduce snow creep between the skin and ski. Longer tail connector for reduced skin weight. When the pow is light, dry and super deep there is still some snow migration under the PU tips on both skins. Below you can see the difference between the Glide PU tip and the Pow, notice not only the difference in length but also shape as the Glide is convex while the Pow is flat. I have to tip my hat to G3 for continuing to try new things and innovate while other brands simply play it safe and continue to produce status quo. This new line of Alpinist Plus Skins is very unique and builds upon the innovation in their earlier Scala skins that we previously reviewed here. The naming convention of the individual skins in the Alpinist line up has to be one of the best features of this new line. It makes selecting the proper climbing skin easy for those who don’t know the difference between mohair and nylon plush and who don’t care to. Pow, Glide, Grip, Universal and Speed really spell it out for consumers and this takes the guesswork out of which climbing skin to buy. In addition to the simplified naming, the new non-toxic glue is a win for mother nature. Overall, I found the glue worked well, not too tacky that you can’t easily separate the skins and still sticky enough that there were not any issues with the glue failing. I did notice though that on colder days (I’m talking -15°C and colder) the glue lost quite a bit of its adhesive qualities, however, this is true for any climbing skins and therefore the Alpinist Pro skins should be stored in your jacket to keep them warm between laps. The PU plastic tips on both the Pow and Glide skins worked well but since we get copious amounts of pow here in the Kootenays, I did find that the Pow tips had some snow creep under the skins. I blame this on their flat design as the glide skins seemed to repel more snow given that the plastic tips were convex in shape. To test this I ski toured several weeks with one skin on each ski and compared traction, glide and snow creep over the course of each day. 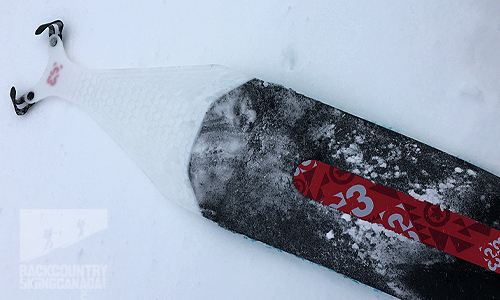 While the Glide skins performed better at preventing snow creep between the skin tips and ski, the Pow skins provided much more grip when the snow was cold and dry. 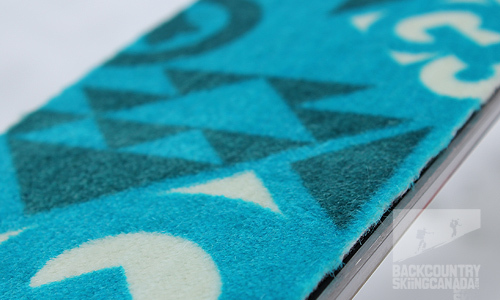 This can be attributed to the universal nylon used in the Pow plush compared to the 70% mohair used in the Glide plush. I found that folding the skins was easy and fast and eliminated any of the hassle you encounter on windy days folding traditional skins glue on glue. I do question the longevity of the glue however as folding the glue side to the plush side means that mohair/nylon fibres contaminate the glue where they come in contact. I anticipate this will only worsen as time goes on. The tip and tail connectors are flawless, easy to use and simple in design, the best on the market by far. Overall, I liked the grip of the Pow skin but the plastic tip of the Glide skin so if I had to purchase just one pair it would have to be the Alpinist Plus Grip skins as they seem to combine the best of both worlds, or perhaps the Universal as these skins shave some weight off that of the Grip Skins. Tip and tail connectors are simple and easy to use. Easy to fold in the wind compared to regular skins. Rigid when folded so they’re easily stored. 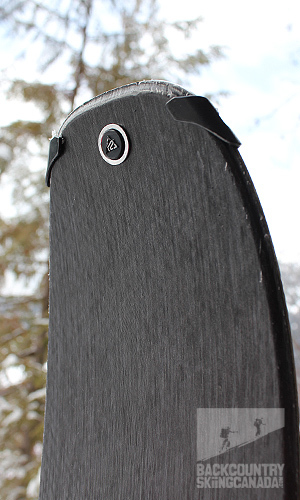 Plastic tip on the Glide skins is convex and prevents snow creeping under it. Glue looses tack the colder it gets so keep them in your jacket on cold days. Fibres from the plush stick on the glue side from folding. Some snow creep under the plastic tip on the Pow skins. Because of the longer plastic tip on the Pow skins, when folded they’re quite long and require more room in your pack to store. Grip could be more aggressive on both skins tested.